Upgrading to a 2016 MacBook Pro means buying USB-C adapters for everything that connects to the laptop, and those costs quickly start to add up. Fortunately, for photographers who need to read SD or microSD memory cards, the cost of a good card reader can be as little as $12. 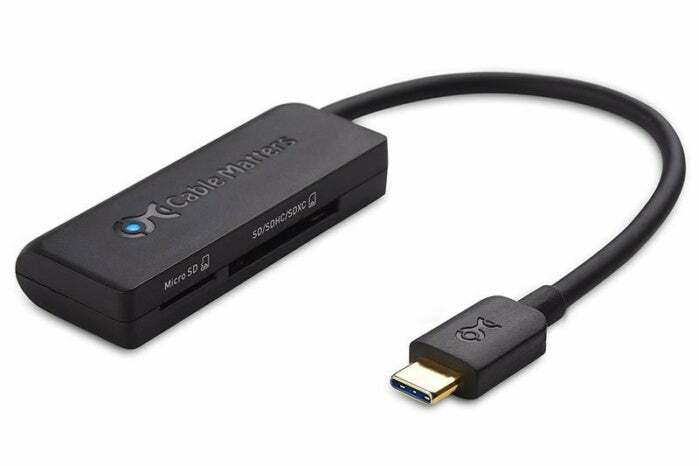 The Cable Matters USB 3.1 Type-C Dual Slot Card Reader ($12 on Amazon) marked the next-best transfer speeds of the models we tested, second only behind the SanDisk Extreme Pro UHS-II USB-C Reader. That device benefits from its ability to read UHS-II cards (which include a second row of pins for greater data throughput), and also posted slightly faster UHS-I speeds—but the SanDisk is priced at $50. For the current majority of photographers whose cameras can’t take advantage of UHS-II, the Cable Matters reader is a clear winner and is almost a steal. To test transfer speeds, we copied two sets of photos and videos from a SanDisk Extreme Pro SDXC card rated at 95 MBps. For photos, we transferred 12.9GB of JPEG and raw images (684 files) three times, for an average time of 2 minutes 37 seconds, or a rate of 82.2 MBps. For video transfer, we copied 31GB (9 files) from the same card, resulting in an average time of 5 minutes 36 seconds, or a rate of 95.6 MBps. Those numbers are just below the speeds from the SanDisk reader, which were 2 minutes 29 seconds (86.6 MBps) for photos and 5 minutes 18 seconds (101 MBps) for videos using the same UHS-I SD card. It’s worth noting that the Cable Matters adapter’s support for the USB 3.1 Gen 1 protocol means it has a theoretical maximum throughput of 5 Gbps, which is about 640 MBps. However, UHS-I SD cards and microSD cards max out at 104 MBps, so the adapter won’t reach its full potential. Megabytes per second (MBps). Longer bars/larger numbers are faster. Click to enlarge. Speed alone would justify the price, but the Cable Matters adapter has a few other things going for it. It’s small and compact, measuring 5.4 by 2.8 inches and just 0.5 inch thick. The 6-inch cable that ends in the USB-C port provides enough clearance that you won’t be fighting for port space with other devices on the MacBook Pro. A small blue LED indicates when the adapter is getting power (although it doesn’t flash to indicate activity). And if you have an SD card and a microSD card inserted into the two slots, both cards can be accessed simultaneously. You want to transfer photos and videos quickly when you’re done capturing photos, and the Cable Matters USB 3.1 Type-C Dual Slot Card Reader delivers fast speeds and good design at a low price.